The xml files grabbed by Alan's Grabber program are very useful, but there seem to be few utilities available to actually view the data in a meaningful way. The only other one I've so far come across is TVGuide, mentioned on Alan's Radio Times Grabber page, but I found it gave far too much information, and seemed very slow loading. So I decided to write a simple viewer for myself. I've tried to make it user-friendly and logical, but I was an amateur programmer who knew nothing about XML or C# before this. So bear that in mind if you decide to try it. Basically, it's meant to be fast and simple. Load an xml file generated by Alan's Radio Times Grabber, and if you're in luck, you should see a list of dates and channels. Select a combination of date and channel, and the program should display the listings for that combination. Click on a listing and you should see the description for that listing. Note: Due to a bug in the .NET 2.0 Framework, when Windows is set to use XP themes the headings in the programme listings do not display properly when using a font size larger than approximately 12 points. If this causes a problem, the Enable Visual Styles for the EPG Viewer option will disable themes for the EPG Viewer only. 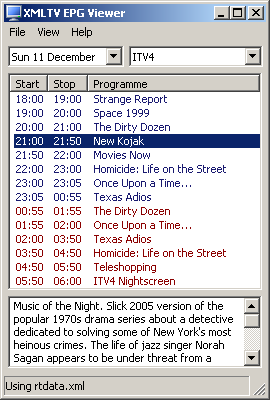 The programme list headings will then display correctly. Changing this option requires that the Viewer be restarted for the changes to take effect, but the user is prompted to do this automatically. Thanks to Alan Birtles for giving me some of his webspace to host this page, and for being so co-operative in adding the encoding feature to his Grabber program. Thanks also to both Martin Thompson and Simon Watkins for their help, advice and suggestions when testing the viewer.